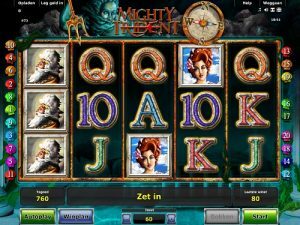 Mighty Trident is one of the most incredible slot games made by Novomatic. It’s visually stunning and there are so many different bonuses and features that it’ll keep you on your toes and entertained for hours. Players of Lord of the Ocean, Book of Ra and Kingdom of Legend will really enjoy this epic slot game, as will any well-seasoned slots player who’s looking for something different, engrossing and able to set their imagination running wild! Come and join NovomaticCasino.co.uk as we journey to Mount Olympus to meet the Greek Gods and get big wins! This slot, steeped in Greek Mythology, is full of intricate and impressive symbols. These include uniquely-designed card value symbols from 10 through to Ace and also 5 different Greek Gods and Goddesses. The lowest-paying God and Goddess are Athena, the Goddess of War, and Hephaestus, the God of Fire, (and apparently the only ‘ugly’ Greek God there is – so you’re sure to recognise him). Then you have Aphrodite, the Goddess of Love and Beauty, and Zeus, the God of Thunder. Lastly, you have the highest-paying God, Poseidon himself, the God of the Sea. The aim of this Mighty Trident slot is to spin at least three matching symbols in a winline, on consecutive reels from left to right to be rewarded with a payout. The size of the payouts will depend on the symbol and your bet amount, and you can check the paytable to see the exact amounts you’ll be paid according to your current bet – which, of course, you can increase or decrease to suit your gaming needs. The favourite feature for regular players of this game is the compass and, once you start playing, you’ll understand why. Every time you get a win, you’ll hear a mighty roar of thunder and the hands of the compass will begin to spin. Eventually the compass will stop spinning and whichever direction the red hand is pointing at: north, south, east or west, will influence your reels! They’ll move one step in the chosen direction and, if you get a win they’ll keep moving in that direction until you stop getting wins. In Mighty Trident, alongside the card values and the Greek Gods and Goddesses, there are also two special symbols: the Wild symbol and the Free Spins symbol. The Wild symbol is Poseidon’s mighty trident itself and this symbol can substitute for all other symbols except the Free Spins symbol. The Free Spins symbol is awesome as whenever you spin three or more, you’ll be rewarded with a number of free spins! During these free spins, the Gods and Goddesses become super stacked so that big wins will be way more attainable! On top of all this mythological madness, there are also four bonuses that can be won during gameplay. These bonuses are randomly triggered after losing rounds and therefore can be awarded at any time! The four different bonuses are: Win Spin, Reel Morph, Reverse Step and Bonus Win. The first three will move the reels in different ways in order to give you wins and payouts. The fourth bonus, the Bonus Win, will give you a random amount of free money! When this one is awarded, Poseidon will strike the reels with his trident and a box will appear in the middle of the reels – it’ll start off at zero but don’t worry, you’ll see the amount rise quickly before your very eyes and potentially reach a massive sum!